"Impressive . . . a powerful indictment of U.S. military and foreign policy." In the years after the Soviet Union imploded, the United States was described first as the globe's "lone superpower," then as a "reluctant sheriff," next as the "indispensable nation," and in the wake of 9/11, as a "New Rome." In this important national bestseller, Chalmers Johnson thoroughly explores the new militarism that is transforming America and compelling us to pick up the burden of empire. Recalling the classic warnings against militarism-from George Washington's Farewell Address to Dwight Eisenhower's denunciation of the military-industrial complex-Johnson uncovers its roots deep in our past. Turning to the present, he maps America's expanding empire of military bases and the vast web of services that support them. He offers a vivid look at the new caste of professional militarists who have infiltrated multiple branches of government, who classify as "secret" everything they do, and for whom the manipulation of the military budget is of vital interest. 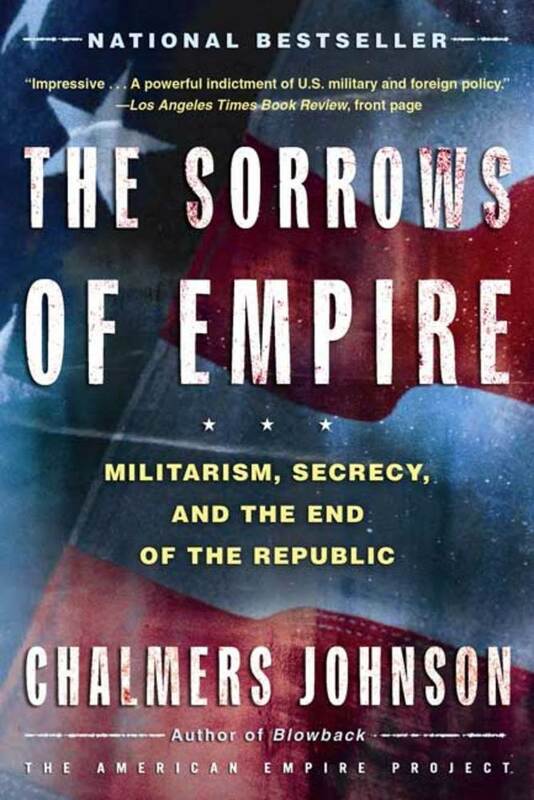 Among Johnson's provocative conclusions is that American militarism is already putting an end to the age of globalization and bankrupting the United States, even as it creates the conditions for a new century of virulent blowback. The Sorrows of Empire suggests that the former American republic has already crossed its Rubicon-with the Pentagon in the lead. Chalmers Johnson, president of the Japan Policy Research Institute, is a frequent contributor to the Los Angeles Times and The Nation. His previous books include the national bestseller Blowback, as well as MITI and the Japanese Miracle. He lives near San Diego.